The Lumley name looms large in the history of County Durham, and the rise of the family in the region begins with an Anglo-Saxon noble by the name of Ligulf (or Liulph) in the aftermath of the Norman Conquest. Fleeing the encroaching Normans in the south, he settled ‘up north’ and made a new home for himself among the followers of St.Cuthbert. He married into the Northumbrian Royal family (to whom he was distantly related) and settled down at what became known as the ‘East Hall’, near the present-day village of Great Lumley. It is long since ruined and (I think) gone, but it was the scene of one of the seminal moments in North-East history. After the Normans had so savagely ravaged, or ‘harried’, the north during 1069-70, King William I entrusted the bishopric of Durham to one William Walcher. A decent enough man by all accounts, he wasn’t the best of delegators, entrusting much of the administration of his lands to Gilbert and Leofwin, who did their very best to enrage the locals. This did nothing to improve relations with the locals. The Normans and their supporters were hugely unpopular in the region, and the murder of Ligulf – a very well-liked guy – was the last straw. So although he wasn’t personally to blame for the crime, Walcher’s failure to punish the miscreants led directly to his own demise. As any student of North-East history will know, the bishop and his entourage (including his two hated henchmen) were soon afterwards jumped upon and slaughtered during a visit to Gateshead. Walcher’s murder in 1080 brought a further ‘harrying’ for the north by King William’s men. Much of the local nobility were slain or scattered for good – but, as we know, the Lumley family managed to survive. 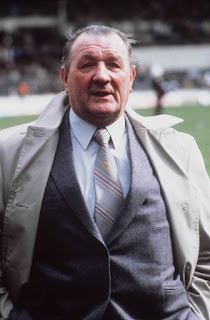 Bob Paisley, the man who was so famously associated with Liverpool FC at the height of their powers a generation ago, was born in Hetton-le-Hole. He was a servant of the club for more than half a century. Paisley was born in the County Durham village on 23rd January 1919, leaving school in 1933 to become a miner. He later became an apprentice bricklayer, and soon forced his way into the famous Bishop Auckland non-league team – winning the Amateur Cup with them in 1939. Just prior to the outbreak of World War II he was snapped up by Liverpool FC, but had to wait until 1946 to make his full and proper debut for the Merseyside club. He served as a ‘Desert Rat’ during hostilities. He played for Liverpool until 1954 – for many of those years as club captain – before moving behind the scenes. He was first a physio, then a coach (under Bill Shankly), being finally promoted to the post of first-team manager in 1974. During his nine-year tenure in charge, Liverpool dominated the sport both at home and abroad. He won six League Championships, three League Cups, one UEFA Cup and, most notably, three European Cups (the latter being a record for a manager). In 1983 he was succeeded by Joe Fagan, though he later returned to work for the club as an advisor and director. He was married to Jessie (in 1946), with whom he had three children, and finally left the club in 1992. He died in 1996, aged 77. In 2008 a grand memorial was unveiled to him in his home town – see here. In the little village of Edmondsley, a mile or so north of Sacriston, was born the first professional footballer to become a Member of the House of Lords. He began life as Thomas Burlison in 1936, and ended it as Baron Burlison of Rowlands Gill in 2008. Never far from his working class roots, he then became a regional officer at the General & Municipal Workers’ Union (later the GMB) – and eventually regional secretary in 1978. From then until deep into the 1990s he operated at the highest levels within this powerful union, but never quite reached the post of general secretary. He was a quiet man, maintaining a low-profile, but became known as ‘The Fixer’ on account of his sprawling network of contacts and wide general influence. He served as treasurer to the Labour Party during 1992-96, was northern region chairman of the TUC and helped many prominent politicians on their way to the top – Tony Blair included. He was vital in the formulation of ‘New Labour’, having spent much of his political career countering the radical activities of the left. By then a resident of Rowlands Gill, he was created a life peer in 1997 and moved into the House of Lords as ‘Baron Burlison of Rowlands Gill’. ‘Hurlyburly Burlison’, as he was known, was married with two children, and died in Gateshead in 2008. Sounds very ‘religious’ doesn’t it? And you’ll not be surprised to learn that, yes, the town of Sacriston does, indeed, owe its founding to something relating to the cathedral down the road. On a little spur overlooking the woods to the north-west of the settlement was the site of a now long-gone medieval manor house. Hugh Pudsey, perhaps Durham’s most famous Bishop, gave the area to the sacristan of Durham Cathedral monastery in the 12th century, and eventually a manor house was built there in the 13th century. In case you’re wondering, a sacristan was a senior monk responsible for sacred relics, together with the general day-to-day running of a religious house (these guys were more recently known as sextons). During its early history, the plot of land was farmed by monks and the revenue raised was used to provide the sacristan with, effectively, his living. Over the years, bits and pieces were sold off, and on the Dissolution what was left was passed back to Durham Cathedral. On maps thereafter it was shown as Sacristan Heugh, but with the coming of large-scale mining in the 19th century – and the development of the nearby town – the area took on the name of Sacriston. However, locals did (and still do) refer to the town affectionately as Segerston or ‘Segga’, a term derived from the old spelling/pronunciation of the root word for ‘sacristan’. Though a few stones from the old manor house survived within Heugh House, a farm building later constructed on the site, the complex was demolished shortly after World War II owing to subsidence caused by the surrounding mineworks.